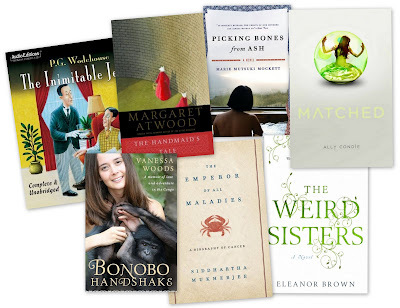 The Sunday Salon: March Books Recap [4.3.2010] – my books. my life. March was a busy month for me so I am happy that I still managed to finish 7 books (let’s ignore the fact that three of them are audio). And it was a pretty successful reading month – I enjoyed all of these and I feel like I was pretty well-rounded. I’m not even going to do a least favorite for this month. It’s been a bit of a rough blogging month. I apologize for my lack of reviews. Silly life getting in the way of blogging. Favorite: The Weird Sisters by Eleanor Brown. How was your reading month? What was your favorite book? I also read 7. I read Sarah Addison Allen’s new book The Peachkeeper, Remarkable Creatures by Tracy Chevalier and Gods In Alabama by Joshilyn Jackson to name a few. All were recommendable reads. If it weren’t for the fact that I’d gotten quite a few posts ahead of myself this month, I would have been in the same boat. Life got the best of me this month. Next month is going to be equally crazy. But for sure my favorite book posted in March was A Visit From the Goon Squad, but overall I read alot of great books. Life has been getting in the way of my blogging too, and you’d be surprised how many others have expressed that same sentiment in March. It must have been a beast of a month for everyone. I know it has been for me! I hope April brings you more relaxing and peaceful reading time. My month was pretty good. I read 8 books :o) Weird Sisters tied as my favorite with Across the Universe by Beth Revis. I’d really like to read Across the Universe. What did you think of the Handmaid’s Tale? It’s one of my favorite novels of all time. Then again, I haven’t read it in a few years — I’d be interested in reading it again to see if it’s held up. Also — any pile of books with Wodehouse makes me happy. I really liked it. I’m sure it holds up. Wow – 7 books is a bad month? That’s a good month for me! Impressive! It’s an average month. But 3 of them were audios. Not much physical reading getting done.